It’s May and that means it’s our favorite of all those national food holidays: Burger Month. 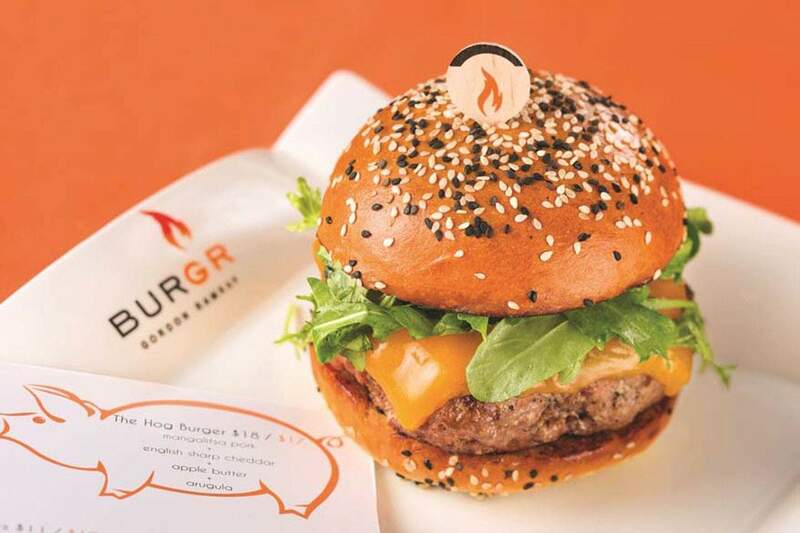 The Hog Burger at Gordon Ramsay BurGR, photo courtesy of Planet Hollywood. Celeb Chef Gordon Ramsay cooks everything with flair, including his hamburgers. The burgers here are cooked over an open flame fueled by hard woods, which gives them their signature flavorful taste. There are lots of options including the Uber Cheese Burger with asadero cheese, fontina cheese, boursin cheese and vintage white cheddar cheese. That’s a whole lotta cheese. If spice is your thing, try the Hell’s Kitchen Burger, made with asadero cheese, roasted jalapeños, avocado, jalapeño pesto aioli and roasted tomato. 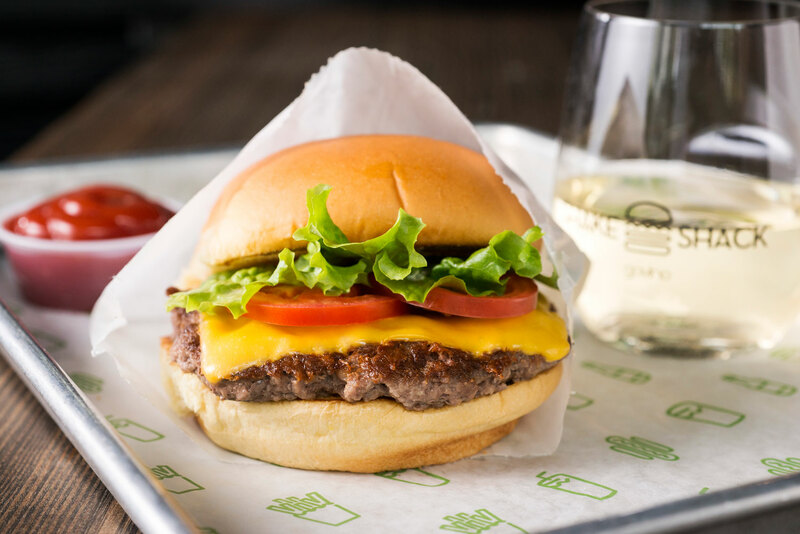 The classic ShackBurger, photo courtesy of Shake Shack. When this New York institution opened up in Vegas we were all excited – and for good reason. These hormone and antibiotic-free Angus burgers are delicious. Especially with that secret Shack Sauce on top. We prefer the original ShackBurger, but you can also choose burgers like the SmokeShack with smoked bacon and cherry pepper or the Shack Stack with a cheeseburger and ‘Shroom Burger stacked together. The signature Umami burger, photo courtesy of SLS Las Vegas. Umami Burger was once named “Burger of the Year” by “GQ” Magazine, so you know these burgers are tasty. The burgers are made with house-ground premium steak and enhanced with seasonings and sauces. 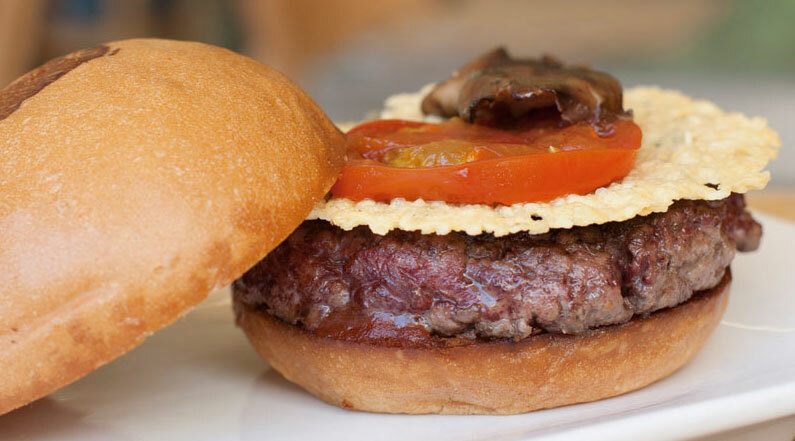 You’ll want to try the Umami with Parmesan, shiitake mushrooms, roasted tomatoes, caramelized onions and house ketchup. Other favorites include the Manly, with house beer-cheddar, bacon lardons, smoked salt onion strings, house ketchup and mustard spread. This restaurant by acclaimed Chef Hubert Keller features a build-your-own burger concept. Choose your meat – with options including beef, lamb and buffalo – then choose a bun, and load it up with toppings, which include everything from chopped jalapeño and pineapple to fried eggs and portobello mushrooms. Finish your burger off with sauces including aioli, truffle mayo, pesto and guacamole. There are also specialty options like The Rossini Burger, a Kobe-style Wagyu beef burger with sauteed foie gras and shaved truffles on an onion bun. The burger is topped with black perigord truffle sauce. Order a secret Molto Burger at B&B Burger & Beer and you won’t be disappointed. Photo courtesy of B&B Burger & Beer. Want a burger from Mario Batali? So do we. He and Joe Bastianich have collaborated to create B&B Burger & Beer, a casual restaurant serving high-quality burgers and a variety of beers. The burgers are made from American beef, served on a charred bun and accompanied by signature side dishes, salads and shakes. If you’re brave, try the Bottom Burner, a spicy combination of pepper jack cheese, jalapeño pesto, onion rings and Mario’s hot sauce. While supplies last, B&B is also currently serving its secret item, The Molto Burger. It is not included in the menu but it is a favorite among guests who know to ask for it. This secret burger is made from ground 90-day dry aged beef. Flippin’ Good Burgers and Shakes, 505 Fremont St. The name says it all – these burgers are flippin’ good. Burgers are made with 100 percent fresh Angus beef ground with chuck, brisket and short rib. You can get a regular burger, cheeseburger, sliders, turkey burger or, if you like things spicy, the Flame Burger with jalapeños and melted pepper jack cheese. Burger toppings include grilled onions jalapeños, barbecue sauce, hot sauce, ranch dressing and Flippin’ Sauce. The Billy Burger , photo courtesy of Holstein’s Shakes & Buns. All of the toppings, buns and condiments here are made in-house and the burgers are made with premium meats. Try the Gold Standard Burger, a hamburger made with dry-aged beef sirloin and topped with smoked bacon, aged goat cheese, tomato confit and garlic chive aioli. For something a little different, check out The Rising Sun with Kobe beef, teriyaki glaze, nori furikake, crispy yam, spicy mayo and tempura avocado. 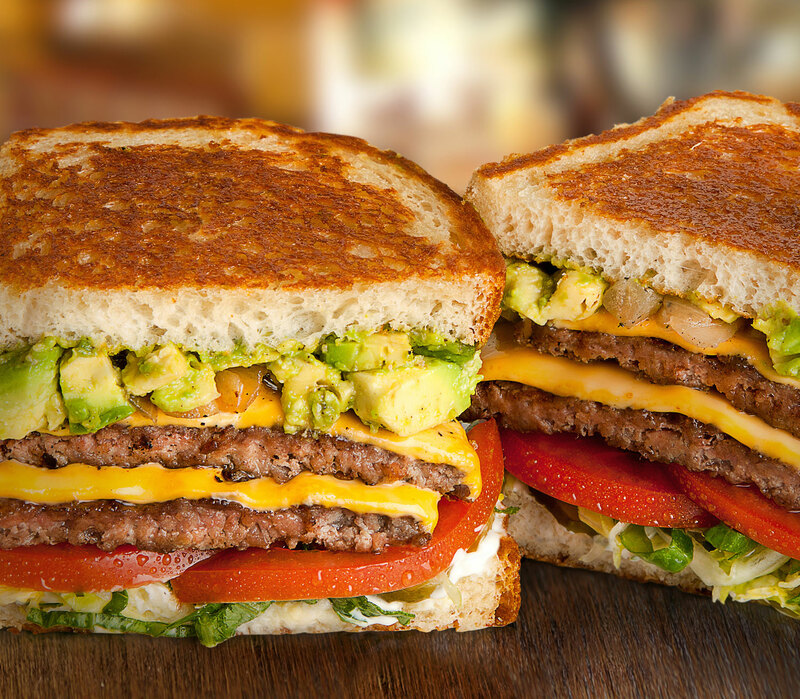 The Santa Barbara-style burger at Habit Burger Grill, photo courtesy of Habit Burger Grill. Ever since this place opened, it has become a habit for us. We love their made-to-order charbroiled burgers, which are grilled over an open flame, then topped with mayo, pickles, tomato, lettuce and caramelized onions. You can get an original or a double. Other varieties include the popular Santa Barbara-style with avocado and cheese or teriyaki-style with grilled pineapple. There’s also a veggie burger option. You’ll want to pair your meal with a side like fries or onion rings. We highly recommend the tempura green beans with a side of ranch. Bobby’s Burger Palace is celebrity chef Bobby Flay’s fast-casual burger concept. The restaurant serves unique burgers like the Bobby Blue with blue cheese, bacon, lettuce and tomato and the Crunchburger with double American cheese and potato chips. In fact, you can get any burger “crunchified” with potato chips on top. Who says you can’t have a burger for breakfast? Get the Brunch burger with fried egg, smoked bacon and American cheese. This burger joint is the new kid on the block. It just opened at Aria last weekend, but we’ve already heard good things about it. All burgers are made with 100 percent fresh American, single-source, grass-fed beef. Choose from a classic burger with organic American cheese and add toppings like nitrate-free bacon. 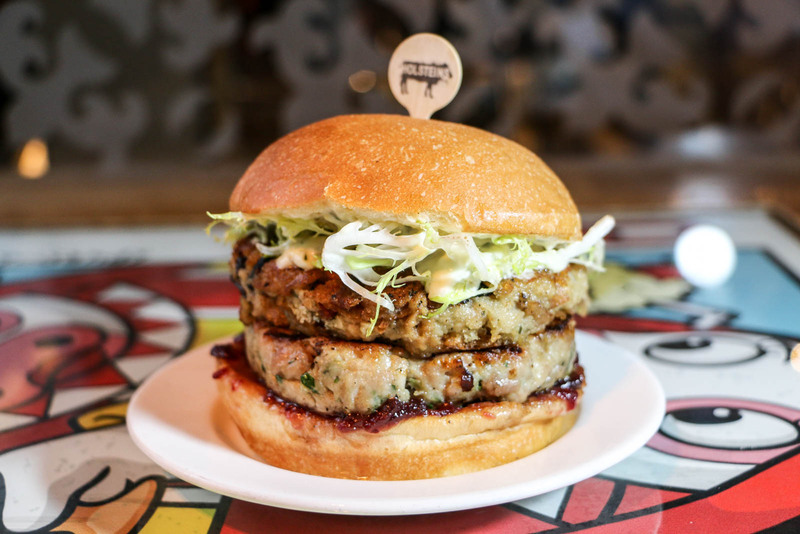 Other choices include a turkey burger, a lamb burger and an organic quinoa veggie burger. 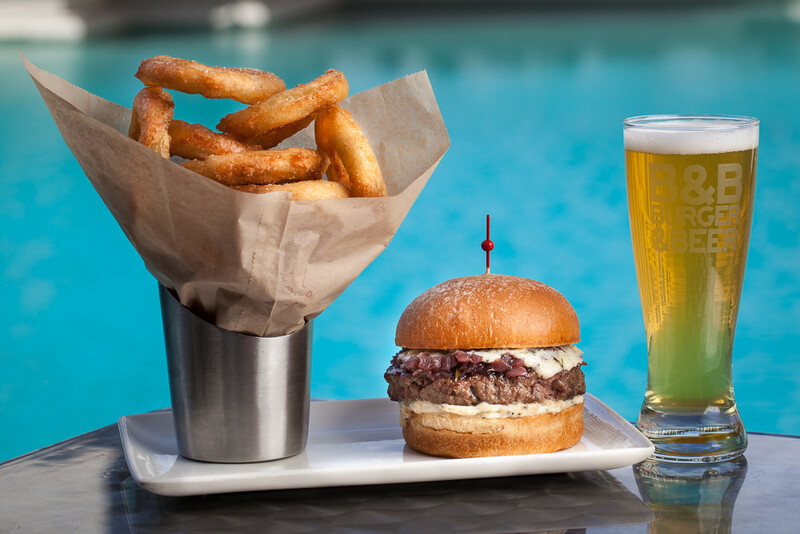 Celebrate National Burger Month at Michael Mina’s PUB 1842, photo courtesy of MGM Grand. Michael Mina’s PUB 1842 will celebrate National Burger Month the entire month of May. For $32, burger enthusiasts can enjoy “The Beast,” a delicious burger piled high with two Black Angus patties, Swiss cheese, onion rings and bacon and accompanied by a 33-ounce boot of Pilsner Urquell beer. The Cinco de Mayo burger at Morels Steakhouse & Bistro, photo courtesy of Morels. Morels is celebrating burgers and beers with its annual popular Burgerfest now through May 30 in honor of National Burger Month. Executive Chef JL Carrera has created six gourmet burgers made with Snake River Farms American Kobe beef, each paired with a craft beer. The special menu is available during lunch from 11 a.m.- 4 p.m. Burger and beer pairings include the Hawaiian with grilled pineapple, onion, Swiss cheese and teriyaki paired with Pennsylvania Tuxedo from Dogfish Head Craft Brewery; and the Cinco de Mayo with pico de gallo, avocado, queso fresco, cabbage and chipotle mayo paired with Upright Six from Upright Brewing. ATOMIC! 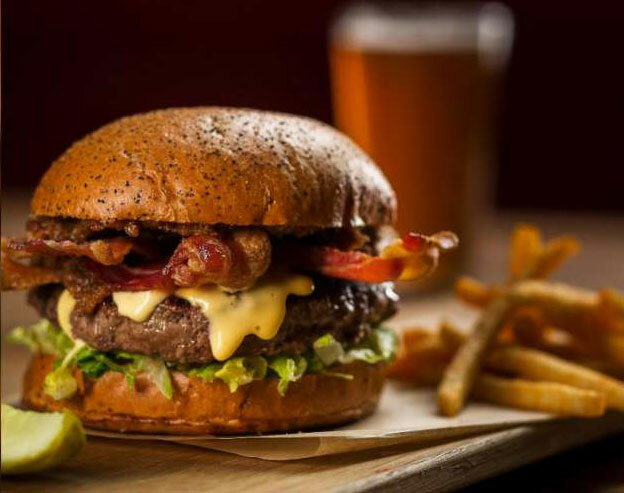 Burger, photo courtesy of Hard Rock Cafe. 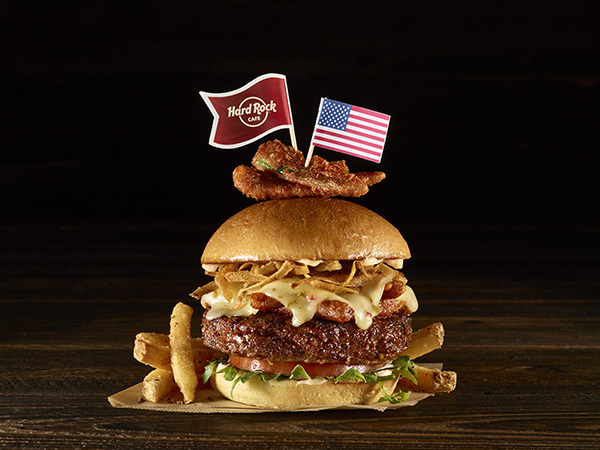 Hard Rock Cafe Las Vegas Strip and The Hard Rock Cafe Las Vegas at Hard Rock Hotel are celebrating National Burger Month with a menu showcasing international Local Legendary Burgers. Check out Las Vegas’ own ATOMIC! Burger featuring beer-battered peppers, pepper jack cheese, caramelized onions, sautéed mushrooms, garlic chipotle ketchup and chipotle mayo. Other options include the English Breakfast Burger, which pays homage to a classic English breakfast, and the Jamaican Jerk Burger, which features mango jalapeño cream cheese and jerk seasoning inspired by Montego Bay. The limited-time menu is available through June 30. 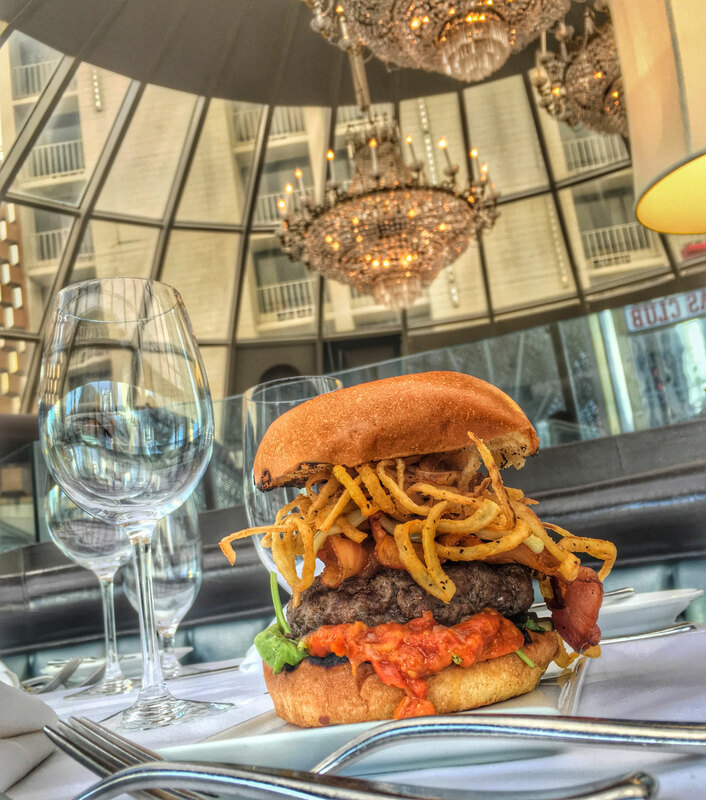 The Creole burger, photo courtesy of Lagasse’s Stadium. Any good sports bar and restaurant has to have great burgers and Lagasse’s Stadium doesn’t disappoint. We love the Creole burger, a half-pound patty of blended Angus beef topped with traditional Louisiana Andouille sausage, caramelized onions and three chile pepper gouda cheese with a spicy garlic mayo; or the foie gras burger, topped with seared foie gras, sautéed mushrooms and caramelized onions with a foie gras black truffle aioli. 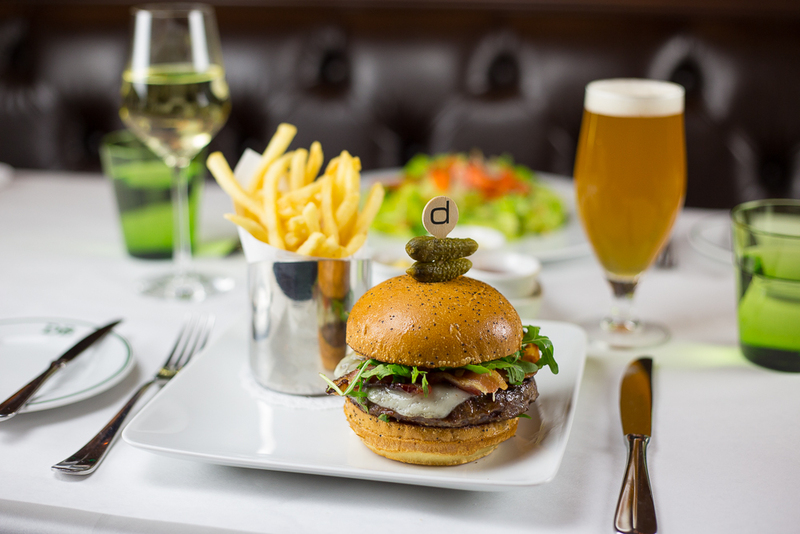 The Frenchie burger, photo courtesy of db Brasserie. Burgers aren’t traditionally a French food, but French Chef Daniel Boulud created his twist on the American favorite. The Frenchie Burger is an 8-ounce Angus beef patty with Morbier cheese, confit pork belly and arugula on a black pepper bun. Bon appétit! The RICO burger at Oscar’s Steakhouse, photo courtesy of the Plaza Hotel & Casino. This summer Oscar’s is featuring a special RICO burger that is an all-beef, half pound burger on a brioche bun with Muenster cheese, tomato chutney, crispy onions, spicy pickles, arugula and smoked bacon. 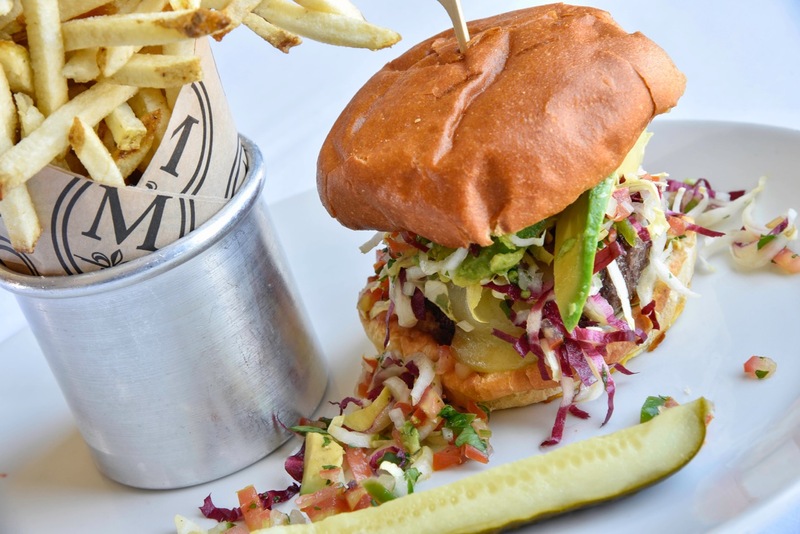 Guests can enjoy this mouthwatering gourmet burger with a domestic beer for $20. 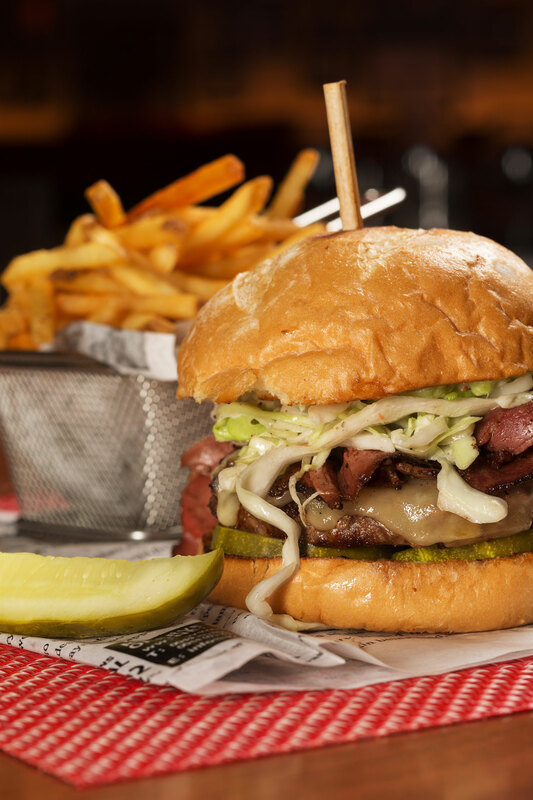 The Meyer Lansky burger, photo courtesy of El Cortez. 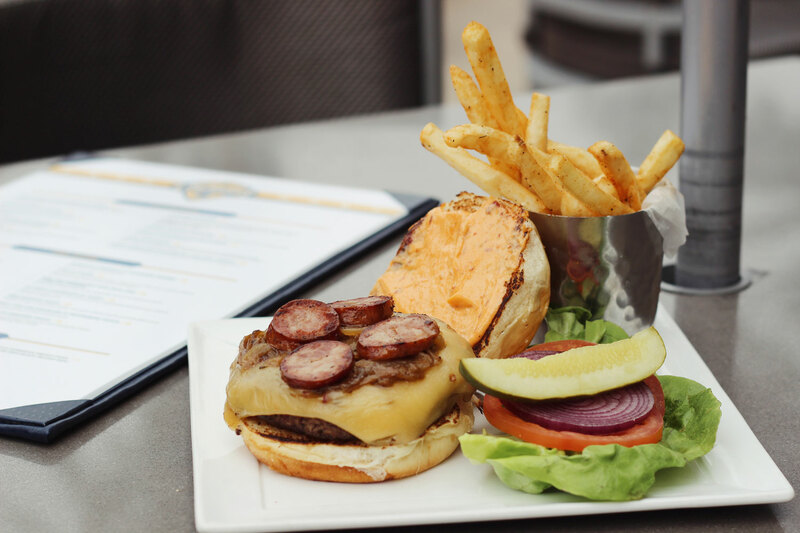 We love the burgers at Siegel’s, which are inspired by some of the famous characters from Vegas’ past like the Bugsy Siegel burger with applewood bacon, grilled onions, sharp cheddar, tomato marmalade, housemade pickles, and Dijon mustard. We also recommend the Meyer Lansky with pastrami, Swiss cheese, house-made cole slaw, pickles, and Russian dressing on a ciabatta bun. Find even more burger restaurants in Las Vegas.